The United Nations General Assembly designated October 15th as International Day of Rural Women, recognizing the critical rural rural, indigenous women play in rural development. A 30 year old Canadian native who became the highest ranking woman in the American Indian Movement. She fought for women’s rights, human rights and native rights. Her death was left suspicious. Rigoberta Menchú Tum is a Guatemalan activist for native rights and winner of the 1992Nobel Peace Prize. She rose to fame in 1982 when she was the subject of a ghost-written autobiography, I, Rigoberta Menchú. At the time, she was an activist living in France because Guatemala was very dangerous for outspoken critics of the government. The book propelled her to international fame, in spite of later allegations that much of it was exaggerated, inaccurate or even fabricated. She has kept a very high profile, continuing to work for native rights around the globe. Native American land rights activist, environmentalist, economist, politician, and author Winona LaDuke has spent her career working on a national level to advocate, raise public support and create funding for environmental groups. A graduate of Harvard and Antioch Universities, LaDuke has become known as a voice for Native American economic and environmental concerns around the globe. Subscribe to get the next sideshow delivered! Subscribe by email and get every slideshow sent to your inbox! Join us and help enlarge our programming. What's coming up next on screen? 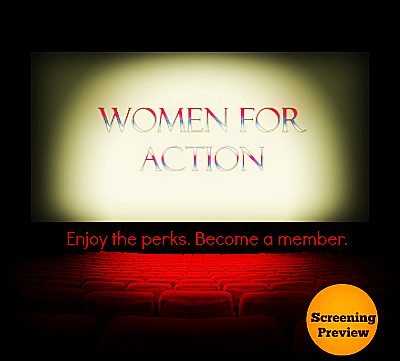 Donate to Women For Action! Need help? First time here? Stop here!